Many genetic engineers have been vocal in their concern over genetically modified (GM) potatoes, but perhaps the most surprising voice is that of Caius Rommens, the creator of 1 type of engineered spud. Rommens was director of research at Simplot Plant Sciences from 2000 to 2013, where he led the development of the GM Innate potato. Over time, the scientist began to have doubts about his own work and the health risks of consuming the potatoes, which are now available in more than 4,000 U.S. supermarkets. In fact, Rommens was so concerned that he wrote a book, Pandora’s Potatoes, which was recently published. In the book, he details how his excitement over GMO technology eventually turned to dread as he began to realize the potential health and environmental hazards his creation could unleash. His intentions were good, to be sure. He believed he could develop a potato that resisted bruise and blight, and that could be used to produce French fries that were less colored and less carcinogenic than regular fries, among other touted benefits. He is most bothered by the fact that research indicates the gene-silencing constructs in the potatoes are active in pollen. This could have a detrimental effect on bees that use GM potato pollen to feed their larvae. Furthermore, silencing the genes responsible for browning in potatoes increases toxins that accumulate in GMO potatoes. EcoWatch notes that a Monsanto GM corn variety was found to have high levels of alpha-aminoadipate, leading the company to rescind an application for its approval in Europe in 2009, after safety regulators raised questions. While there is no data showing how much alpha-aminoadipate Innate potatoes contain, Rommens said he believes that Simplot should meticulously determine these levels. The GMO potatoes also contain another potential toxin called chaconine-malonyl. Not much is known about the substance, but Rommen said his ex-colleagues found that it increased by nearly 200% when PPO genes are silenced. 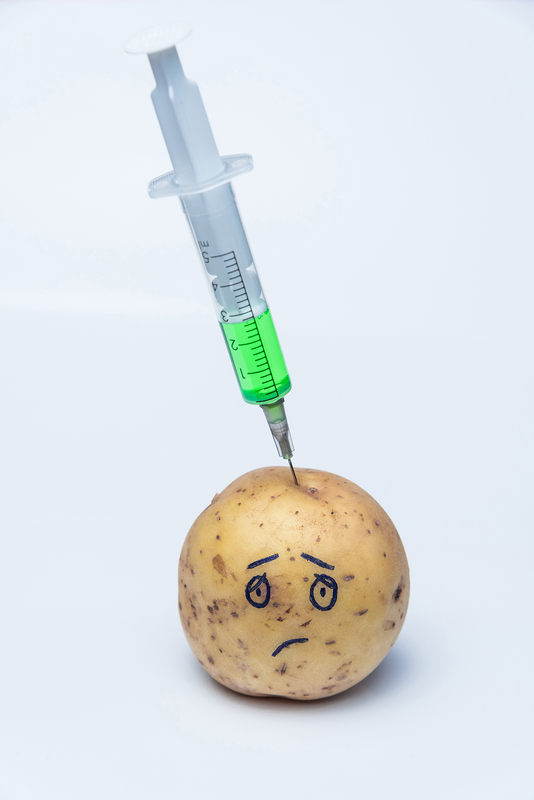 According to Rommens, genetically engineering the potatoes to avoid plight might have been a useless venture as well. And as for the Simplot potatoes being turned into less-carcinogenic French fries, well, that might just be wishful thinking. “The GM potato does contain a resistance gene that provides protection against late blight. The problem is that nobody knows how long the protection will last. Plant breeders have tested many different resistance genes in the past, and these genes are almost always overcome by quickly evolving pathogens. In the end, Rommens said, he didn’t put enough thought into the possibility that his modifications might have caused “unintended effects.” Upon studying publicly-available literature, however, he realized he had missed the forest for the trees, as the old saying goes. The Project has an established set of criteria that it uses to determine if a crop needs to be moved from the Monitored-Risk list to the High-Risk list. This set of criteria helps tease out whether a crop has the serious potential to spread GMO contamination in the conventional and non-GMO supply chain. The potatoes’ addition to the High-Risk list means that products made with potatoes will undergo added scrutiny before they can become Non-GMO Project Verified. Fortunately, it’s easy to avoid GMO potatoes at the supermarket. They are sold under the names White Russet or Simplot Innate. If you see those on the label, keep moving. Always buy organic or non-GMO produce, whenever possible, as this will spur a greater demand for these types of products. Thank you for this vital information, as potatoes are a staple for us. I’ll be sure to avoid the White Russet and Simplot Innate potatoes. — And good for Rommens for informing people about the dangers of GM potatoes. His is an honorable action, unlike those of Monsanto (Bayer), which constantly lies about its products. There’s also a GM non-browning apple on the market – the Arctic apple from Okanagan Specialty Fruits, a Canadian GM company. It was introduced in the US despite immense outrage and warnings from US apple growers and from the public; the public comments were essentially Ignored, as often happens. Arctic apples are most often found in party trays of sliced fruits and vegetables and in products such as pies that use sliced apples. One day, after a ‘sufficient’ number of injuries and deaths, GM-product companies will quit denying science and will acknowledge the fact that genes work in concert. Tampering with one gene one gene can affect many others unpredictably – and, as Rommens said, may also affect the genes of animals (including people) who eat the GM products. Once again nothing but fear mongering. How sad.